Other than being one of the most popular clubs in German football, Hamburger Sport-Verein is also one of the most successful. In addition to their six national championship titles, they have won three DFB-Pokals, one Cup Winners' Cup and one European Cup. HSV also holds the honor of being the only club never to be relegated from the top division of German football. 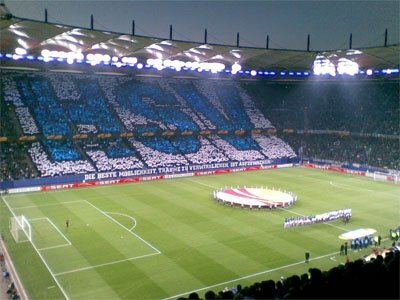 Europa-League match on the Volksparkstadion. Officially, the club was founded in 1887, under the name of SC Germania. Yet, they would not be known as Hamburger SV until 1919 and a merger with two other Hamburg clubs: FC Falke Eppendorf and Hamburger FC. The merger quickly proved to be a shrewd business move, as HSV won its first Victoria trophy in 1923. The club continued to be a force in German football, which resulted in a second national title in 1928. The post-war period was less kind to HSV. Even though the club remained dominant in local competitions, it had to wait until the swinging 60s for its time in the spotlight on the national scene. Led by Uwe Seeler, its top goalscorer of all time, HSV defeated FC Köln 3-2 in the 1960 championship finals in order to claim its third national title. Three years later, the club won its first DFB-Pokal by routing Borussia Dortmund 3-0. The club's most remarkable period started during the mid-70s, around the same time Felix Magath arrived at the club. Even though the famous attacking midfielder was just one of many football stars that passed through the club in those years, he became a synonym for HSV's golden era. During his decade at the club (1976-1986), HSV won three Bundesliga titles, its second DFB-Pokal and two European trophies: the Cup Winners' Cup in 1977 and a European Cup in 1983. Magath himself scored the winning goal in the European Cup final against Juventus, which HSV won 1-0. The 1987 DFB-Pokal would be the last trophy HSV would win to this day. The club was soon overcome with financial troubles, which saw them sell their best players in order to survive. For the majority of the next two decades, HSV would most often be seen just above the relegation zone. The Volksparkstadion was demolished in 1998 and replaced with a bigger stadium, which also was named Volksparkstadion (or Hamburg Arena). After the new stadium was built it has shifting names several times due to various sponsorship deals. It became AOL Arena 2001-2007, HSH Nordbank Arena 2007-2010 and Imtech Arena 2010 – 2015. The logo of Hamburger SV is featureless being only a 45 degree angled white and black square inside a blue colored rectangle. The blue color has according to some sources its origin from the flag signal Blauer Peter (Blue Peter), which means that the ship is soon about to sail.